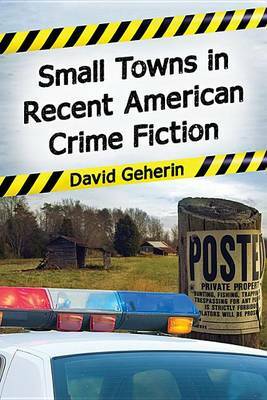 Small-town settings have long been commonplace in crime and mystery fiction, but usually only in cozy mysteries. Typically, the crimes in these novels were solved by amateur sleuths like Agatha Christie's Miss Marple, whose efforts restored peace and tranquilly to the quiet community. But in recent years, writers of realistic crime fiction about cops, private eyes, and county sheriffs who might ordinarily have set their novels in big cities have discovered fresh creative possibilities in small-town locations. This shift from the mean streets of the city to Main Street allows these authors to take advantage of many of the distinctive features of small-town life - a sense of community, a slower pace of life, proximity to nature - and yet still deal with meaningful social, economic, and environmental issues. Because crimes that occur in small communities also often have a greater personal impact on the local population, the human element that is often lost in novels set in urban settings where crime is a more common occurrence can be emphasized even more forcefully. This book introduces readers to ten notable contemporary authors who have placed small towns like Rocksburg, Pennsylvania (K. C. Constantine), West Table, Missouri (Daniel Woodrell), Niniltna, Alaska (Dana Stabenow), Aurora, Minnesota (William Kent Krueger), Paradise, Michigan (Steve Hamilton), Millersburg, Ohio (P. L. Gaus), Heartsdale, Georgia (Karin Slaughter), Millers Kill, New York (Julia Spencer-Fleming), Durant, Wyoming (Craig Johnson), and a variety of America's National Parks (Nevada Barr) on the map of the contemporary American crime novel.